Four world class trainers and mentors will be coming to Tallinn, Estonia already this fall for intense training weekends followed by one-on-one mentoring. Don’t miss this exclusive opportunity to skyrocket your sales on international level! Applications will open in July and you have time to apply until 16th of August. The first training programme will start from 31st of August and is focusing on B2B sales and marketing. Next year’s programme will be for B2C startups. Build individual sales strategies with the help of world class trainings and mentors. 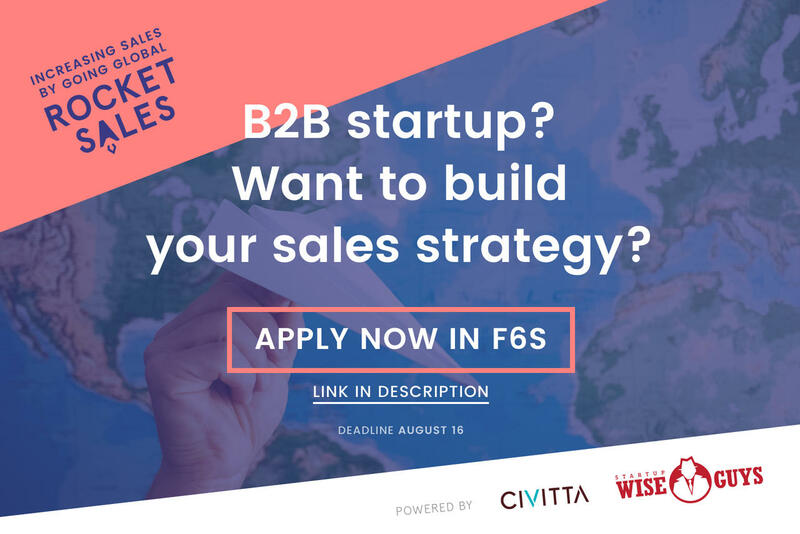 Startup sales programme bringing in world-class practical knowledge to Estonian startups. The startups receive all-round support from four awesome international coaches and mentors. The programme is set up in two distinct activities - trainings to get the basics sorted; and mentoring to work individually with all startups. Main outcome: sales action plan, including strategy for entering a foreign market, and a marketing plan. Programme is free of charge for 20 selected startups. Dan Toma (Mentor “Sales”) has more than 10 years of work experience as startup entrepreneur and corporate innovation manager. Dan Toma has a clear understanding of the challenges involved in building sustainable businesses from the ground up. He has worked at Deutsche Telekom and, among others, also designed and ran a startup accelerator in Vietnam as part of a Finnish Ministry of Foreign Affairs official development aid program. The Sales Block focuses on among things on segmentation, value proposition design, sales funnel design, CRM implementation and behavioural economics. We recognize that the peculiarities of a complex environment such as B2B present an unique set of challenges for both first-time as well as serial entrepreneurs. Confidently navigating the sales process and/or the partner acquisition process in a complex environment can represent the difference between efficiency and mounting overhead costs. Christina Forsgard co-founded Netprofile Finland in 2000 to cater to the needs of technology businesses in connecting with their target audiences. She has more than two decades of experience in public relations, of which social media has been an important platform in her daily work for nearly a decade. Max Gurvits is a lawyer turned entrepreneur. He co-founded and exited the first online law firm in The Netherlands, and turned to helping teams avoid the mistakes he made before. He believes New Europe is the best place to build growth startups, and is working specifically with connecting CEE startups with international angel investors. Max will be mentoring the startups on marketing. The Marketing Block focuses on modern marketing for startups. The principles and outcomes of the block are a plan for goal driven marketing with clear goals and metrics, happy target groups and aligned organisations. Startups will learn how to attract, convert, close and delight their customers. Tristan Kromer’s career goal is to create (not capture) value. He is particularly interested in creative collaboration, education, and behavioral psychology. Tristan applies lean startup principles to teams and innovation ecosystems. The New Markets Block is focused on training early stage startups on how to find new customer segments in new markets, understand what they want, and determine whether or not a specific (new) customer segment will help the startup make forward progress. The program is powered by Startup Wise Guys and Civitta. 60 Estonian startups will take part in an entrepreneurship program initiated by Startup Estonia. The program covers coaching from world class experts, who will help the startups to create a plan for international expansion. All the participants will receive further support for a full year after finishing the program.